Can you condense a well-known phrase down to just a few letters and symbols? Can you do it using fewer characters than any other player, but still get your message across? 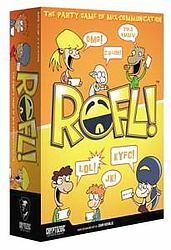 Find out with ROFL!, the hilarious party game of mix-communications! ROFL! pits players against each other as they strive to condense messages down to as few characters as possible. If the Guesser can figure out the original phrase from your clue before time runs out, you both score points! The player with the most points after three rounds wins the game! OMG! Take turns guessing messages in as few characters as possible! Can you do it before time runs out?! LOL! Messages come from a variety of selections made famous in television, movies, books, songs, well-known sayings and historical quotes! ROFL! comes with 170 double-sided cards that will change up the game each time you play! BFF! Great fun for up to 7 players will have you playing for hours on end! FYI! To be declared the winner, you will have to score more points than all the other players! Do you have what it takes to win ROFL!? Game design and illustrations by John Kovalic, one of the developers of Apples to Apples and the acclaimed illustrator behind the Munchkin card game series!